Although many recipients of these CDs are elderly people who do not use the internet, most of them have family members who do. Download cards provide a way for them to bridge the generational gap and share the comforting gift of music they have received. A clear explanation of the purpose of the cards is included so they will understand that the cards are intended to be shared. Download Cards are free with the purchase of personalized CDs and matching cards. This one-to-one pairing applies to either single or wholesale CD purchases. For example, if you order 25 CDs with (25) matching cards, you'll also receive 25 download cards at no additional cost. 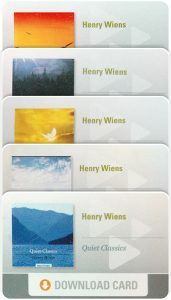 If your purchase was an assortment of CD titles, you will receive the same corresponding assortment of download cards. Download cards are 3.375" x 2.125" and can easily be included inside the 4.25" x 5.5" matching cards. They look attractive since they match both the CD and its matching card. They are valuable - the same CD downloads are available on iTunes for $9.99! Cards are easily redeemed by visiting a website and entering a code found on the back of the card. Gift recipients can give the card to any family member or friend who uses the internet to download music. In this way they would receive one free digital copy of the same CD given. Free download cards are completely optional. Feel free to continue with the original CD gift packages.